A hand carved figure of the Buddha, possibly in bone, but more likely ivory (the typical graining is not visible, but the colour and feel are correct - graining may only be visible under the gold) mounted in an 18k yellow gold setting. 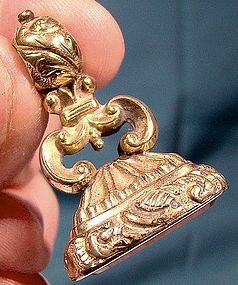 Dating to the 1960s, this 1" high pendant or charm features the carving with a gold loop and base. 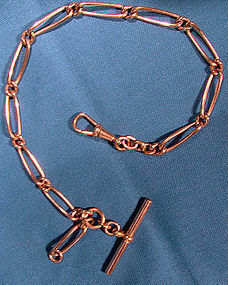 The loop has a maker's mark and the base has the Italian 750 84 H gold mark. It weighs 5.0 grams, and it is in excellent condition with no chips, cracks, dents, bends, corrosion, losses, damage or repairs. It is definitely hand carved bone or tusk, we are not sure what type. All items are thoroughly and conservatively graded and all condition issues are noted; all items are vintage or antique and may have slight signs of gentle use. Expedited shipping to the U.S. starts at $22 - this includes online tracking, air service and insurance for loss. Items paid with a credit card will be shipped to confirmed addresses only. We do ship internationally. All of our prices are in $US. PLEASE NOTE: We DO NOT accept PayPal, only VISA and MASTERCARD. 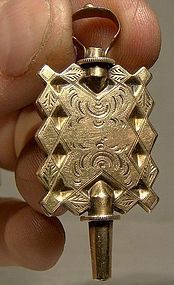 A 1" diameter watch fob or pendant consisting of a dated 1791 English "Spade" Guinea in .917 gold (22 karat). 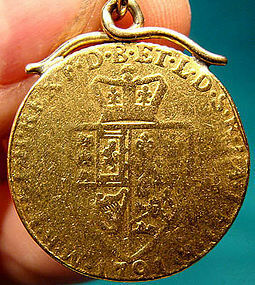 This King George III coin has been soldered to a gold wire suspension, and it weighs 8.74 grams. 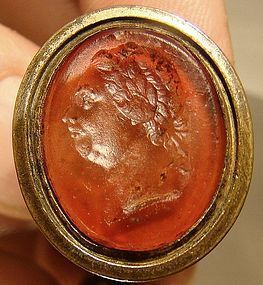 It was worn for years as a gold charm and it has the expected wear with some loss of detail and edge reeding. 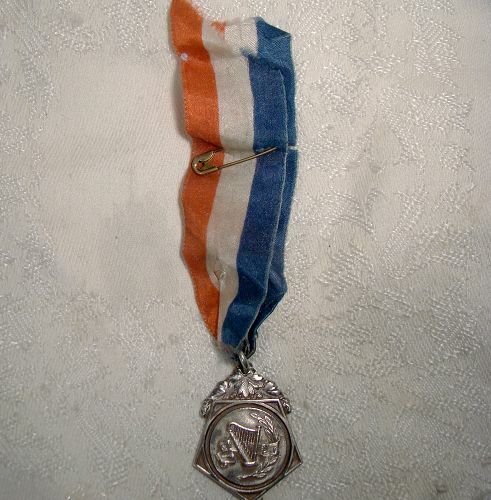 This item is in as described condition with no dents, bends, corrosion, losses, damage or repairs other than the mounting for hanging and the wear. All items are thoroughly and conservatively graded and all condition issues are noted; all items are vintage or antique and may have slight signs of gentle use. Expedited tracked and insured parcel shipping to the U.S. starts at $27 (other spots may vary, air is higher). Items paid with a credit card will be shipped to confirmed addresses only. We do ship internationally. All of our prices are in $US. PLEASE NOTE: we DO NOT accept PayPal, only VISA and MASTERCARD. 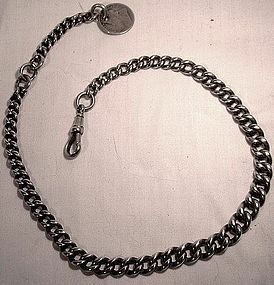 An English sterling silver graduated heavy link watch chain, hallmarked with a date stamp on the swivel and onecente-loop for Birmingham 1901. 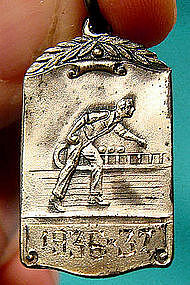 The fob is an 1897 English silver thruppence - threepenny or three pence silver coin. 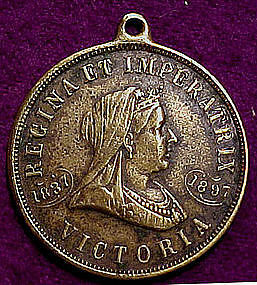 This coin was sometimes used as here to commemorate Queen Victoria's Diamond Jubilee in 1897 celebrating 60 years reign. Each link has the lion passant mark for sterling silver. This watch fob chain weighs 39.5 grams, and it is in mostly excellent condition with no breaks, corrosion, losses, damage or repairs, just wear consistent with its age and silver content, and signs of wear to the end loop. 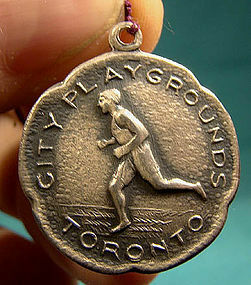 The coin does show visible signs of wear and scratches. All condition issues are noted; all items are vintage/antique and have signs of use. Expedited tracked parcel shipping to the U.S. starts at $21 (other spots may vary, xpresspost is higher) - tracking and insurance are included in shipping quotes. Items paid with a credit card will be sent to confirmed addresses only. We do ship internationally. All of our prices are in $US. PLEASE NOTE: WE DO NOT accept PayPal, only VISA and MASTERCARD.